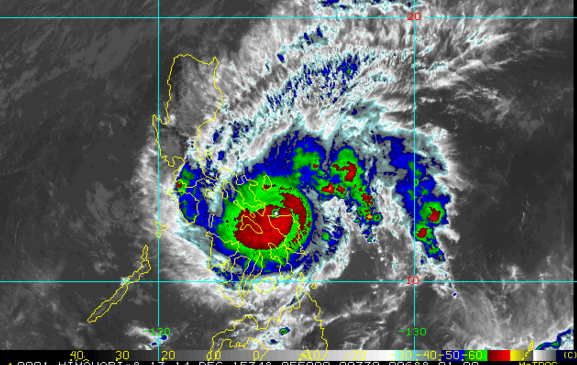 MANILA, Philippines - Typhoon Nona has crossed Burias Islands and is now traversing Sibuyan Sea, state weather bureau PAGASA announced on its 11pm update Monday night, December 14, 2015. At 10:00 PM today, the eye of Typhoon 'Nona' was located based on all available data including Virac Doppler Radar over Sibuyan Sea or 100 km East Northeast of Romblon, Romblon (12.7°N, 123.2°E). 'Bagyong Nona' has maximum sustained winds of 150 kph near the center and gustiness of up to 185 kph. It is forecast to move West at 15 kph. Public Storm Warning Signal No. 3 (121-170 kph Expected in 18hrs. ): Oriental Mindoro, Masbate including Ticao and Burias Islands, Albay, Marinduque and Romblon. The estimated rainfall amount is from heavy to at times intense within the 250 km diameter of the typhoon. Flash floods and landslides are expected over the areas under signals # 2 and 3, while storm surges of up to 3 meters are possible. 'Nona' is expected to pass over Mindoro provinces tomorrow afternoon. PSWS elsewhere has now been lifted. The public and the disaster risk reduction and management council concerned are advised to take appropriate actions and watch for the next Severe Weather Bulletin to be issued tomorrow.